There are remains of 40 thousand people in the Charnel House. The graveyard Chapel of All Saints (also known as Bone Church or Ossuary Chapel in Sedlec) from the end of the 14th century was rebuilt in baroque style by J. B. Santini. It was decorated entirely with human bones which were arranged into pyramids by a half-blind monk in 1511. 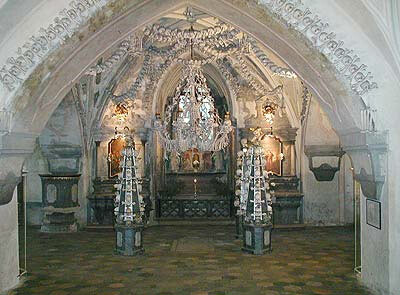 The chapel can be visited during our Ossuary Tour - guided tour from Prague to Kutna Hora and back. I caught the train here from Prague and the Ossary is just a short walk from the station. It is very macabre but very impressive. A small church type building that has used 40,000 peoples bones to make all the fixtures and fittings. The old mint is also worth a visit, there is a painting covering one of the walls whose eyes follow you wherever you stand.